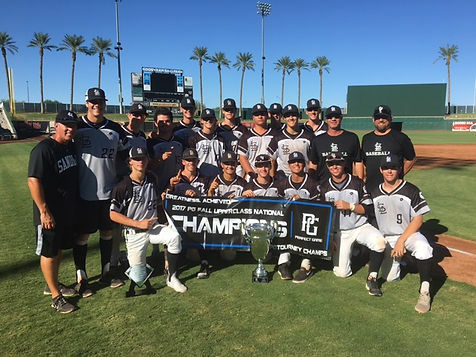 It was an All- Arizona celebration at the conclusion of the 2017 Perfect Game Fall National Championships, with teams from the Grand Canyon State taking the title in the Upperclass Division and the Freshman Division. In the Upperclass Division, Wilson Sandlot 2018 moved their record to 17-0 in 3 PG events this summer, defeating TB- So Cal Gold in the Championship 4-0. Sandlot had to battle through a 12 inning nail biter in a Sunday quarter final to reach play on Monday. In Monday mornings semi-final , Sandlot took a 5-2 win over Aggies baseball to advance to the ‘ship. Hamilton senior Hayden Baker, a University of Pacific Commit, tossed 5 shutout innings, scattering 3 hits in the title game to earn the W. He also earned Most Valuable Pitcher for the Tournament for the effort. Bobby Meza (Red Mountain) was named the Tournament MVP, throwing 6 1/3 scoreless innings on the bump and leading the team in RBIs with 11. In the Freshman Division, GBG Arizona ran the table, going 6-0 in the tournament and defeating their cousins from California , GBG Marucci, 3-2 in the championship game. Tanner Smith (Basha 2021) was named Tournament MVP, hitting .412 for the weekend with a homer and 8 RBIs. Carson Baker (Liberty 2021) was named Most Valuable Pitcher after working 10 1/3 innings with 11 Ks in 3 appearances over the weekend.